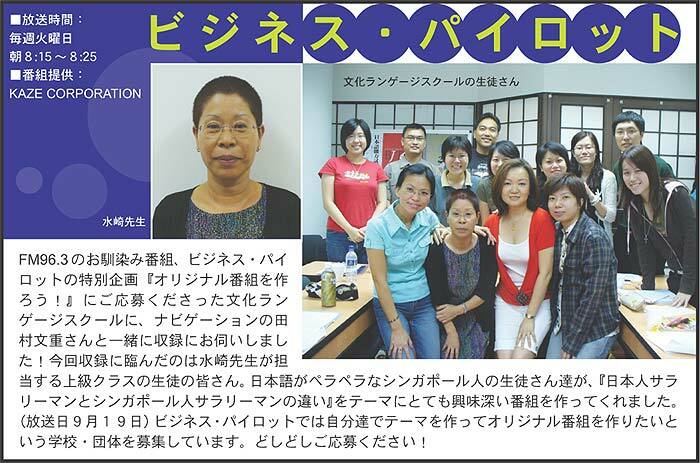 Advanced students (JETRO Business Japanese) of Bunka Language Pte. School went on-air! "Let's Create an Original Radio Show!" is a special project on FM96.3's regular segment of Business Pilot. Mr. Tamura Fumishige, the Business Pilot "navigator" with J-plus in tow, called on Bunka Language School which had applied to participate in this programme. The participants are students from the school's advanced course (JETRO Business Japanese) under teacher-in-charge, Mizusaki sensei. For their show, these Japanese-proficient students came up with an interesting discussion topic of "The differences between Japanese and Singaporean Salary Man (white-collar workers)". The recording airs on 19th September. Schools or organizations interested in creating their own original shows on Business Pilot, are welcomed to apply!